I love my Vitamix and the wonderful fiber-filled smoothies I make with it, but sometimes I just want juice. And during those times, I pull out my old hand-me-down juicer and whip up something tasty. Someday, I will buy a juicer that allows me to juice greens as well as fruits and veggies (I'm rather fond of the Omega and Samson juicers). But in the meantime, my old Juiceman and I are making due. Here's a tasty little juice I whipped up this morning. It was lovely; sweet, minerally, tart, and fresh. It was the most lovely, easy, and nourishing way to re-enter the world of food after five days of liquid fasting for Blessed Herbs Colon Cleanse. I loved the cleanse and feel it was very effective, but drinking only vegetable broth and apple juice psyllium drink was getting a little old. Adding in solid food and green juices is a wonderful change. I'll be writing up a full review of my experience with the cleanse soon. 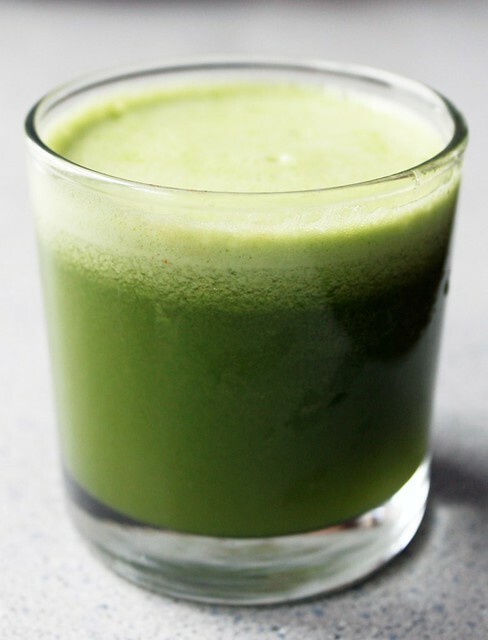 I think you'll like this juice, and it couldn't be easier to make. I like that it isn't terribly sugary, relying mostly on green veggies with a touch of apple. The fruits and vegetables in this juice are not terribly expensive and are easy to find, so it is affordable and easy to shop for. As always, try to use only organic fruits and veggies when you juice. If you have a limited access to organic produce or are on a very limited budget, check out this list for a suggestion of how to prioritize your organic purchases. Use organic produce when juicing if possible! Wash all ingredients well. Cut in a size that fits your juicer's feeder tube. Remove rind from lemon if putting in the juicer, or if your juicer doesn't handle citrus well (like mine), juice manually with a citrus reamer and reserve juice. Run everything through the juicer. If you juiced the lemon manually, add to the juice and mix in. Serve immediately, or chill until ready to drink.